Woooo, the first post of 2017. What did I do on new year? Well nothing much really. I was doing a puzzle, making some accessories and jewelry while watching Spongebob from Viaplay. I must be the most interesting person ever oh my gosh. Though we did a quick run at the store and the liquor store but I decided not to drink after all. I even fell asleep before 12. Though I was rudely waken at 12 when the neighbors started to bang their rockets very close by. Few days ago I had a little anxiety episode which included a trip to the ER late in the night. Not to mention my dad calling me, while I was on my way there, and informing that our family dog isn't doing so well. Great, everything's just great. After I got out of the monitoring ward and the "all clear" to head home that same night, I had been feeling somewhat better. Let's hope it stays that way. So yeah I was making some diy stuff yesterday and I thought it would be cool to make a kind of chain belt. So I tore apart some old necklace scarps I had, and put together this cross belt! I was thinking I would make a similar one with ankhs as well. I was thinking tough that I would make a little giveaway on this blog, and the prize would be a similar belt to this one, or the ankh version. Would that be something you would like? I would of course make it the winners preferred size. Though this one I made for myself is very adjustable so I can wear it as high as I want or as low as I want. Oh my, sorry about the horrible mess at the back it always happen when I get ready in the morning.. 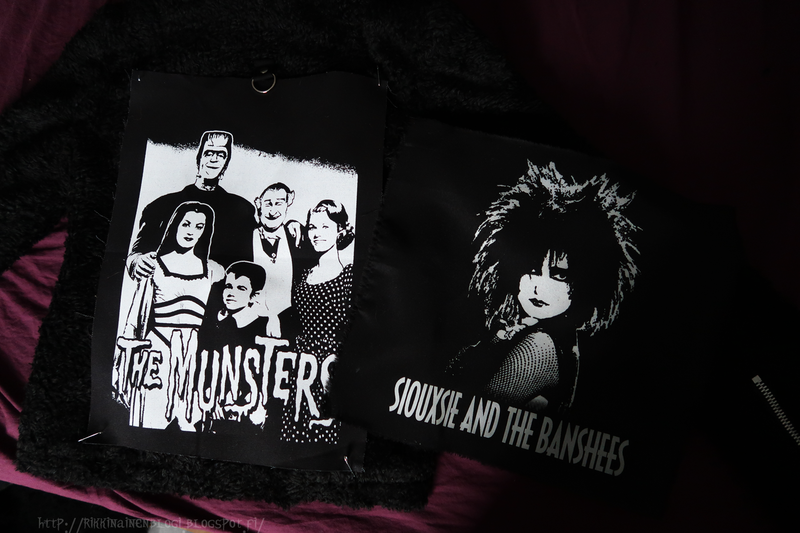 I also have 2 diy jackets in progress and I have ordered these 2 back patches for them. Sure I could have made some kind of patches myself, but with the stuff I currently have it would had taken forever or it could had not worked at all. But well, it always makes me happy to help out some etsy shops. I just can't decide which one to put on the faux fur jacket and which on to the leather jacket. These decisions always tare me apart. I do highly recommend both shops! Anyways I hope you had a great start of the year 2017! Love the belt! I think it would make a fabulous giveaway. I love the idea of upycling old jewellery into something new the belt looks amazing. Great idea. Any hope your feeling better since your incident to the hospital. Don't worry about being boring on New Years Eve some years, I haven't made it past 10. Thanks! Yeah, sometimes people sell like massive bags of used jewelry in flea markets, they're like treasure bags to me hehe. I'm feeling somewhat better now thanks. Nooh ainakin paremmin kuin sinä päivänä on mennyt mutta se on vähän ollut vuoristorataa. Voi pieniä kisuja. :< Onneksi omat kisut ei oikein ole moksiskaan mutta harmittaa kyllä tosi paljon muiden eläinten puolesta aina uutena vuotena. :/ Noh onneksi niitä ei monta kertaa vuodessa paukutella. Sorry to hear about your ER scare. Hope the new year gets better from here! Beautiful belt--it turned out wonderful! An ankh one would be awesome! I'm sure it will. At least I hope so. Thanks, I'll be making the ankh too very soon! :) Little crafty things always put me in such a good mood!